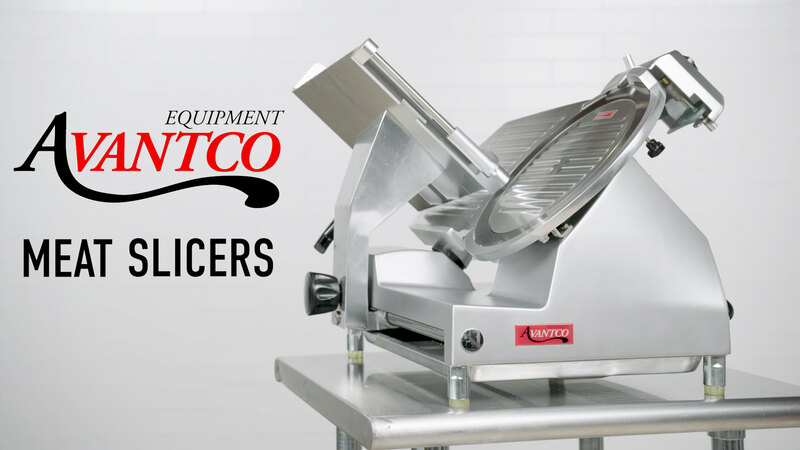 The Avantco SL309 9" manual gravity feed slicer features a compact design that's ideal for small operations where space is at a premium! It's great for slicing vegetables and processed meat, making it a good fit for small delis, coffee shops, sub shops, and small restaurants. This 9" slicer is constructed of top quality aluminum for durability and ease of cleaning, and features a built-in sharpening assembly. 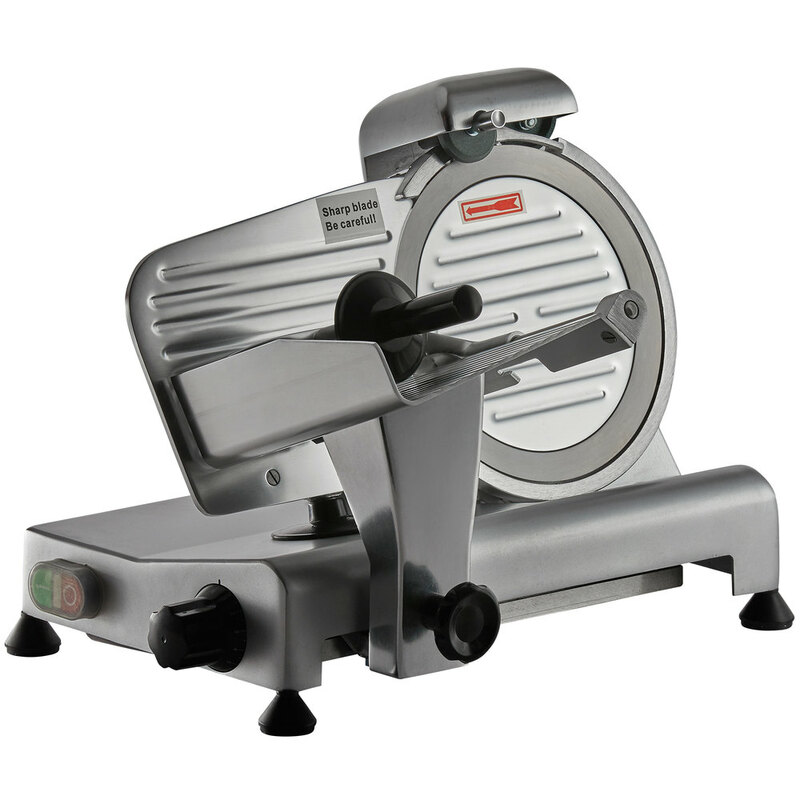 The slicer's blade is constructed of stainless steel and is belt-driven by a 1/4 hp motor. It has a fixed ring guard for safety, and the meat carriage is removable for easy cleanup. The cut thickness is easily adjustable from 1/16" to 1/2". This 9" Avantco slicer is excellent for low-volume applications of less than 1 hour of slicing per day. It is not suitable for continuous, heavy use, or for slicing cheese and raw / frozen meat. Maximum Product Size: 7 1/2" x 5"
This slicer was purchased after we had owned a Hobart for 13 years. We wanted something light duty and affordable so we went with this and have not been disappointed. Does the job for slicing meats and cheeses for a few hours a day 4 days a week. I've had this slicer for about 2 years. Never had any issues. We use it daily to cut meat and cheeses. I would for sure buy again! Was uncertain before buying this product because always hesitant to buy a product that is expensive but so happy we went with this brand! slices the meat really well and is easy to clean. tzemach W. from boeuf & bun corp. I am very impressed with this slicer. It is light weight yet tough - I have sliced cooked meat, cold-cuts (pepperoni and salami) and vegetables (tomatoes, onions). This slicer is fantastic for small, medium and large operations! We use a series of these in all of our operations! FANTASTIC PURCHASE! I would recommend for sure. So far so good. This slicer seems to work as well as the Hobart I've used in the past. It is manual, but if you are slicing most meats, especially delicate meats like roast beef, you need to be at the slicer anyway. It simply removes that temptation to set it on auto. I have a couple complaints, it could be easier to clean, but none the less, the slider comes off and the blade cover does too, so the only difficult place to clean is right behind the blade. We'll see how long it lasts. I'm sure it won't be as long as a hobart, but for this price point, it can't really be beat. decent unit for small operations or mobile food vendors. Bought this 2 years ago and still works good for my needs with no real issues. Some areas are hard to clean but overall straight-forward product. 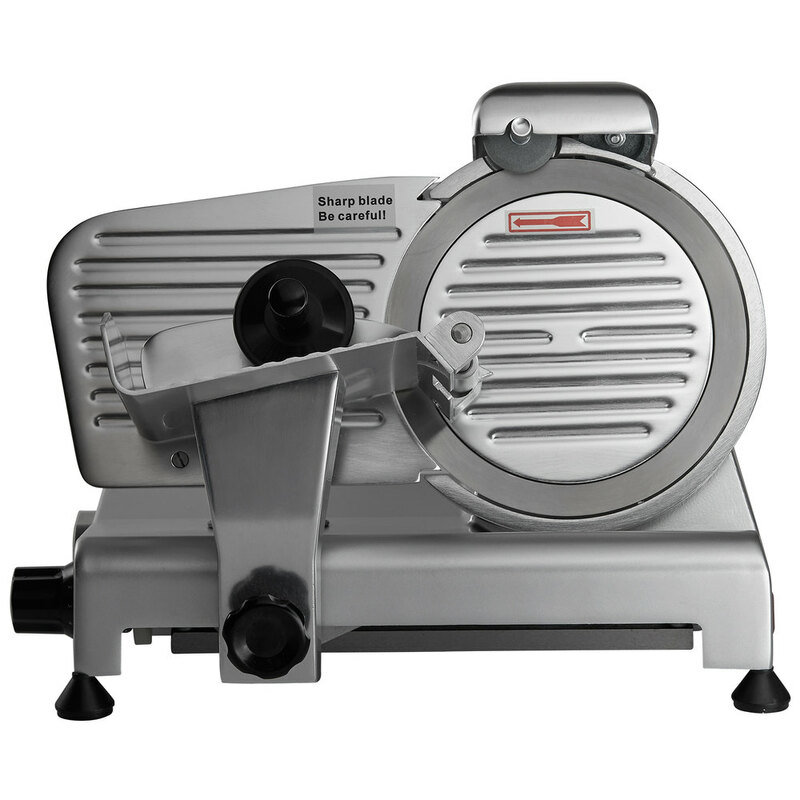 This slicer is great for our small food truck and other low volume operations. The blade easily slices meats however is not powerful enough for cheeses. I would have given it five stars but it is more difficult to clean than higher end models and it could be nicer it was not angled so high for the slice. This slicer works great, and is the perfect size for a smaller operation. 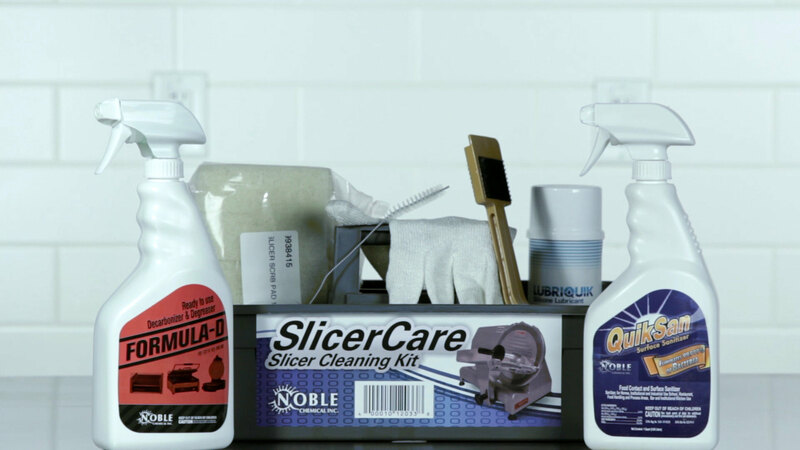 The blades come apart to make cleaning easier, but there are some nooks and crannies that can be a little difficult to clean. Corey C. from The French Press Coffee Co.
We bought this as a second slicer to use exclusively on vegan products. It is very small, and I would worry if we needed to use it a ton, but it is perfect for our needs. It is not hard to clean, and it doesn't take up too much counter space. Very nice, small and compact slicer. We will be using this to slice charcuterie, and I feel that it will hold up well in our small restaurant. The only negative comment is that cleaning it can be a bit difficult as there is a protective guard around the blade that catches debris easily. Perfect size for medium volume lunch. We serve cafe lunch and use 3 meats. Easy storage also since its small and light weight. Highly recommend for low-medium volume cafe that serves sliced meat. Dave D. from Rocky River Coffee Co.
Amazing slicer I was hesitant about getting this because I wanted to use it to cut cheese and meats. I cut 6 ponds of provolone cheese and 5 pounds of mozzarella and then 3 pounds of sharp cheddar all about 1/8" thick and the slicer never bogged down or got boged down. I LOVE this slicer and cut paper thin slices of roast beef just freeze the ram meat for about 15 to 20 minutes and slice away works amazing. I highly recommend this slicer to any one. We decided to try this slicer for 2 reasons, its compact design and its price. The compact design is absolutely necessary in our small kitchen, where work space is at a minimum. So far it had done a great job for us. It slices the meat well, and it is pretty easy to clean. The smaller cutting surface requires a few more motions when using but the saved space is well worth it. So far it powered thru anything we send at it. When we bought this initially we worried because slicing cheese is not recommended. We found it can slice cheese, just don't force it thru, and take a little more time to let it cut and it works fine. I would recommend this for any kitchen that is highly limited in space. this machine is pretty good but i didn't realized that it doesn't cut frozen meat. no problem, i just let it thaw out and cut it afterward. The slicer guard wedges the meat on the backside of blade, if removed it will throw the meat out the backside. It has a 1" inch block which prevents slicing all the product. Creates allot of waste. I'm having a bit of trouble with this meat slicer. I have another one, a different brand, and this one seems to "splash up" when slicing certain things so we rest a towel on top of it. Otherwise, it works really well and for the price, it can't be beat! 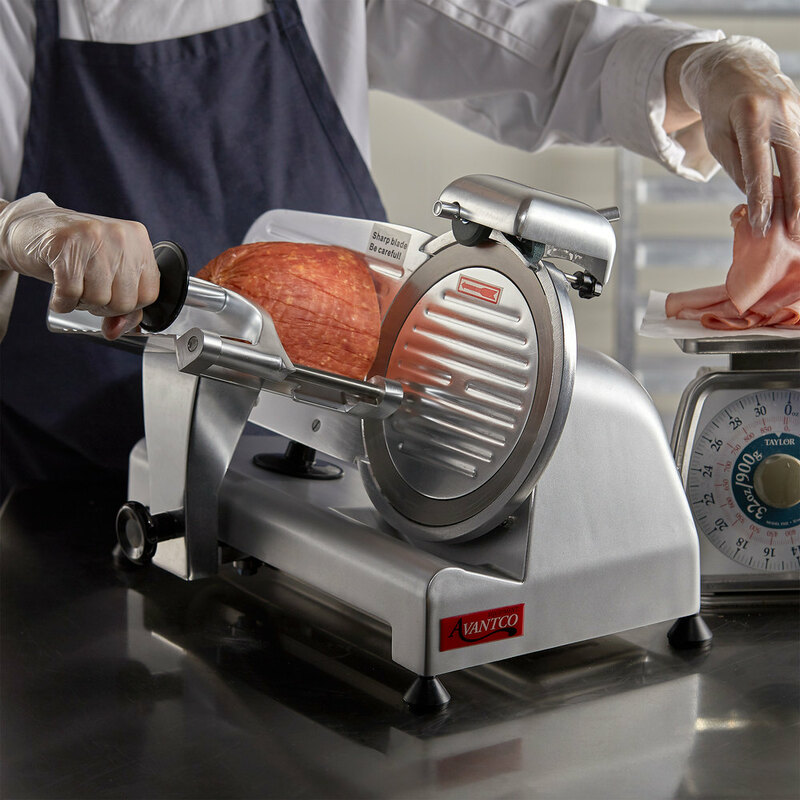 This Avantco Meat slicer is perfect for our kitchen. We slice ham and swiss cheese and it works great. We can adjust the thickness and it is a quiet running machine. We highly recommend! Jacqueline A. from Havana Nights Café & Bakery Inc.
Great low priced meat slicer. The price is right, but my only concern is difficulty cleaning the equipment components. Other meat slicers are designed to be easily cleaned and this one is a chore. This item arrived sooner than expected which made it even better. The blade is rather difficult to remove for cleaning. You have to take you time removing it and be extremely careful not to cut yourself because of the housing around it. I mean extremely careful. Overall, this is a handsome, well built slicer and exactly what I have been looking for. I owned a slicer made in Poland that I brought back from living in Prague, that lasted for more than 15 years. When the gear stripped and I couldn't get a replacement part, I found this slicer. This is a great value and high quality compared to the slicers sold in stores (it's not plastic)! Also look at the wattage of this slicer compared to the retail ones, to get this power you would be paying twice this amount. Great Product! Great Price and deliver time was also excellent. This is a nice slicer. We don't have a lot of slicing but it is really nice to have this slicer for a reasonable price. We didn't want to have to invest thousands of dollars to get a slicer for our Bistro. It's perfect for slicing a few blocks of cheese a week. It's definitely much more "powerful" than the slicer we were using and gets the job done much quicker. My only gripes are 1) there is a nut/bolt behind the blade that sometimes catches the cheese slice and tears it 2) there isn't a "tray" underneath to catch the cheese 3) cleaning this thing is kind of a difficult. The instructions (or lack thereof) weren't all that descriptive, and we can't really seem to figure out the best way to clean this thing. Our old slicer was simple to dismantle and we could run parts of it through the dishwasher, but we've pretty much been wiping this one down bc it doesn't really come apart. Definitely recommended for light duty, but wish it were easier to clean. Great meat slicer for a great price. Who says that deli slicers have to cost thousands of dollars? This does the job and does it well!